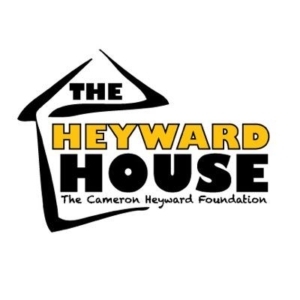 Cam and his family established The Cameron Heyward House to inspire & enable all young people, especially those from disadvantaged circumstances, to reach their full potential as caring citizens. Cam and his foundation have once again teamed up with Pledge It to help The Boys & Girls Clubs of Western Pennsylvania. This season, with the help of my teammates, I’m inviting fans to help kids in Pittsburgh by making a pledge for every sack we record this season. Make a pledge for every sack the Steelers record during the 2016 season. 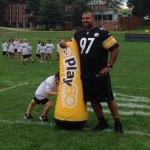 All proceeds from Cameron Heyward’s “Sacks for Kids” campaign will directly go towards funding sports programs in the Boys and Girls Club of Western Pennsylvania. The Boys & Girls Clubs of Western Pennsylvania has been in operation for over 127 years as a staple in the community with a mission to enable all young people, especially those who need us most, to reach their full potential as productive, caring, responsible citizens. Further, our core belief is to provide: a safe place to learn and grow, ongoing relationships with caring adult professionals, life-enhancing programs and character development experiences, hope and opportunity. We currently serve over 7,000 youth each year in our eight branch sites throughout Allegheny County. When schools are out, the Club is in! We operate during after school hours and throughout the summer bringing all young people ages 5-18 programs in Sports, Fitness and Recreation, Education and Career, the Arts, Character and Leadership Development, and Health and Life Skills. We strive every day to ensure every young person who enters our doors has the best opportunity at a Great Future. This campaign goes beyond football, it’s about giving to those who truly need and deserve our support. Thank you for supporting my cause and all of your support throughout my career! Cam and Allie Heyward are also active in their community throughout the season and offseason by hosting and supporting important causes. Cam also attends various events and activities hosted by his teammates or the Steelers which benefit many great causes. Cam is the Steelers Spokesperson for the United Way of Allegheny County. 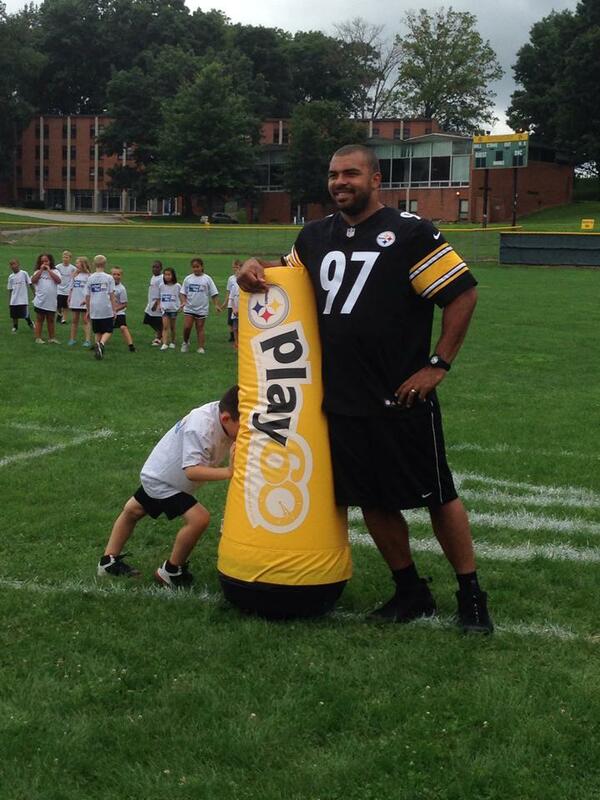 Steelers spokesperson Cam Heyward took his break between practices training camp for a photo shot for United Way’s Team NFL! View photos of Cam’s involvement with the United Way of Allegheny County HERE. The lesson Steelers’ players were teaching on Tuesday afternoon wasn’t about who was the fastest, or the strongest or most athletic. It was about who was committed to making a difference in their own lives by staying active and focusing on a healthy lifestyle. Cam Heyward, the Steelers’ United Way spokesman, and the team’s rookies shared that lesson at the 17th Annual NFL/United Way Hometown Huddle. 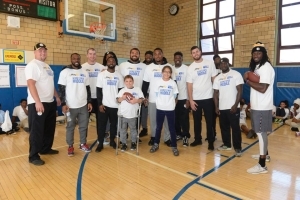 The event was a part of a league-wide day of service with the United Way encouraging kids to play 60 minutes a day.